University Research Awards, which provide “seed” grants for promising research, have been awarded to 15 projects for 2018-19. 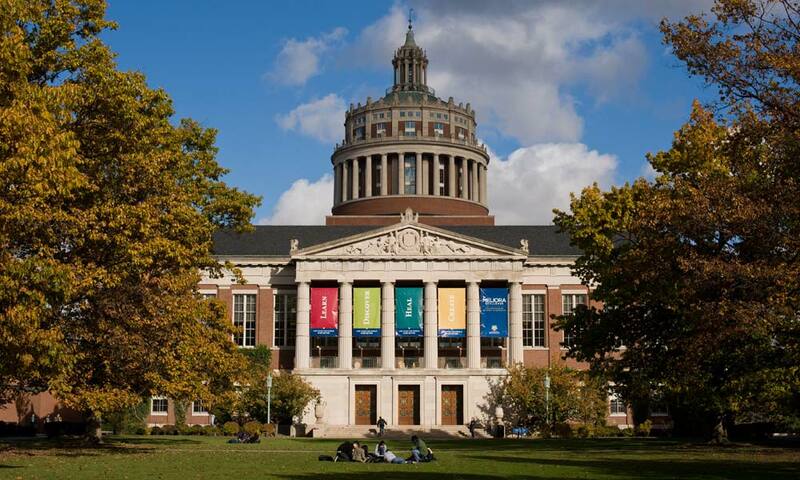 The projects range from an analysis of the roles of prisons in the Rochester region, to a new approach to genome editing, to new initiatives for advanced materials for powerful lasers. The funding has been increased from $500,000 to $1 million. Half of the funding comes from the President’s Fund, with the rest being matched by the various schools whose faculty members are recipients. Inscriptr Genome Editing – Directed Non-homologous DNA Integration: Douglas Anderson, assistant professor, Aab Cardiovascular Research Institute. Particle Assembly of Mesomorphic Ceramics (Advanced Materials for Powerful Lasers Initiative): Mitchell Anthamatten, Shaw Chen, and Matthew Yates, professors of chemical engineering, and Thomas Brown, professor of optics. Robust Optical Devices Comprising Glassy Liquid Crystals with Photoalignment Polymer Films (Advanced Materials for Powerful Lasers Initiative): Shaw Chen, professor, and Alexander Shestopalov, associate professor, both of chemical engineering, and Tanya Kosc, scientist, Laboratory for Laser Energetics. Autonomic Nervous System Biomarkers Distinguish Epileptic vs. Psychogenic Seizures: David Auerbach, research assistant professor, Aab Cardiovascular Research Institute; Jean-Phillippe Couderc, associate professor of medicine; and Giuseppe Erba, professor emeritus, and Giovanni Schifitto, professor, both of neurology. How Is Rochester a Prison Town? Joel Burges, assistant professor of English; Kristin Doughty, assistant professor of anthropology; Kara Finnigan, associate professor of educational leadership; Evelyn Leblanc-Roberge, assistant professor of art and art history; Diane Morse, associate professor of psychiatry; Dena Swanson, associate professor of counseling and human development, and Joshua Dubler, assistant professor of religion. Pre-clinical mouse model for atypical hemolytic uremic syndrome (aHUS): Ian Dickerson, associate professor of neuroscience, and Joseph Miano, professor, Aab Cardiovascular Research Institute. White Matter Integrity and Cognitive Performance in Adolescents with Primary Hypertension: Marc Lande, professor of pediatrics; and Heather Adams, associate professor, and Giovanni Schifitto, professor, both of neurology. Non-invasive quantitative assessment of tendon healing using ultrasound and machine learning: Alayna Loiselle, assistant professor, Center for Musculoskeletal Research, and Constantinos Ketonis, assistant professor of orthopaedics. Disparate Geographies: Spatial and Racial Landscapes in Rochester, New York: Kathryn Mariner, assistant professor of anthropology. Novel Supramolecular Hydrogels for Sustained and Localized Drug Delivery: Bradley Nilsson, associate professor of chemistry, and Takahiro Takano, research assistant professor, Eastman Institute for Oral Health. Quantum Optomechanical Networks: John Nichol, assistant professor of physics, and William Renninger, assistant professor of optics. Bifunctional tandem-catalysts for CO2 conversion to plastics, chemicals and fuels: Marc Porosoff, assistant professor of chemical engineering. Daily Emotional Reactivity among Adolescents: Genetic and Early Environmental Contributors and Longitudinal Outcomes: Lisa Starr, assistant professor of psychology. Brain Elastography with Optical Coherence Tomography: Kevin Parker, the William F. May Professor of Engineering; Jannick Rolland, the Brian J. Thompson Professor of Optical Engineering, and Maiken Nedergaard, professor of neurosurgery. Computer Vision Enabled Quantitative Analytics for Ultra-Widefield Fluorescein Angiography: Ajay Kuriyan, assistant professor of ophthalmology; Rajeev Ramchandran, associate professor of ophthalmology, and Gaurav Sharma, professor of electrical and computer engineering. Read more about University Research Awards and past recipients.